Leeds 6 stabled outside the Depot at the Heaton Park Tramway on 30th November 2008. Hull 96, latterly known as Leeds 6, is the oldest electric tramcar at the Heaton Park Tramway at Manchester, and has undergone many radical transformations during its lifetime. The tram was built in 1901 as a double-deck open topper, but after only five years it received a distinctive ‘Bellamy’ roof (the same as Wallasey 78 at Birkenhead). A second rebuild followed in 1921, when car 96 was fully enclosed. In this form it looked similar to Hull 132, which is preserved today in Hull’s Streetlife Museum. 96 owes its survival to its use as a works car following withdrawal from passenger service, and it took on this role from 1933 onwards, which entailed the removal of its upper deck. In 1945 it was sold for further service in Leeds, again as a works vehicle, where it was renumbered 6 and repainted in a rather plain grey livery. Final withdrawal came at the time of the closure of the Leeds system in 1959, but thanks to the efforts of some dedicated enthusiasts, the tram was set aside for preservation. The tram had to wait until 1988 before it ran again – this time on the Heaton Park line, where it regained its Hull colours and original fleet number of 96. Unfortunately due to the low height of their tram depot it could not be restored as a double-decker, so instead it took on yet another new form as an enclosed single deck passenger car. This was totally unauthentic, but it did allow the tramway to run the only operational Hull tram in the world. More recently, car 96 has undergone a body overhaul and received attention to a motor defect. The completion of this project co-incided with the acquisition of Blackpool Railgrinder 752, and a plan was hatched to hold a special works car themed event at Heaton Park. 96 was subsequently completed in grey livery and became Leeds 6 once again in 2008, although this is only believed to be temporary. Plans to fit a bow collector and mini-tower to the car unfortunately had to be put on hold due to a few technical problems, but it is hoped to resolve this in time for 2009, in order to commemorate the 50th anniversary of the closure of the Leeds tramway. Whether you prefer to call it Leeds 6 or Hull 96, there is no doubting that this tram is a most remarkable survivor with a fascinating history. As well as being the only operational representative of the Hull tramway system, it has an unusual matchboard dash at each end. 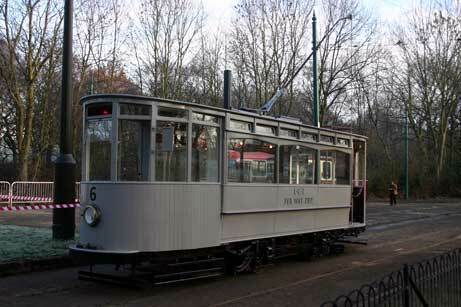 Who knows what the future holds for this tram – maybe it could even regain its Bellamy top cover one day!? Author: Andrew Waddington, based on research from a set of postcards detailing ‘A Century of 96’, available in the gift shop at the Heaton Park Tramway.